It's a rainy Monday morning in my hometown today. Usually on days like this I would whip up some sort of hearty stew or heavy beef dish, but today is Meatless Monday so I guess I will have to stick to salad right? WRONG! 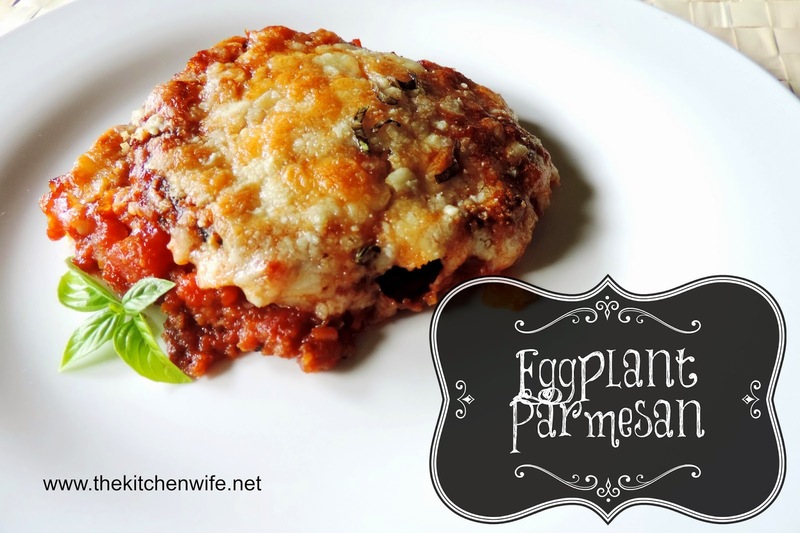 No, in fact, I am going comfort food to the MAX with this AMAZING Eggplant Parmesan! Watch out because you may never look at Meatless Monday the same way again!! I will be the first to admit that this is not a 30 minute meal. Just like with most comfort foods, good things take time. However, like a lasagna, you can make this on Sunday and bake it off on Monday for dinner! PERFECT! To begin, thinly slice your eggplant. Next, place the eggplant on a paper towel lined baking sheet and season with salt on both sides and let set for at least 30 minutes. This is VERY important. One, because eggplant has a lot of moisture in it and if you do not want soggy eggplant parm, you will need to draw out the excess water. Two, eggplant can be slightly bitter so by salting now, you are drawing out the bitterness. While you are waiting for the eggplant to do its thing, you can prepare your sauce. To a hot sauce pan, add 2-3 tbsp. of olive oil and the onion and garlic. Cook until the onion is soft and translucent. Once the onions are soft and translucent, add the crushed tomatoes to the pan. Now add a little salt, pepper, and chili flake for seasoning. Then, add the brown sugar. This will make for a sweet sauce. However, if you are not one who likes a sweet sauce, you can omit it. Stir together and let simmer over medium/low heat for 15-30 minutes. After your sauce has finished its simmer, add the fresh basil and set to the side. Now it is time to get our eggplant breaded and fried. Again, you do not have to fry your eggplant. You can omit this process and simply layer and bake it off, but I just don't know why you would. The flavor and texture this adds to your dish is AMAZING! In three shallow dishes, add the flour with some salt and pepper, eggs, and then the bread crumbs. In a heavy bottom skillet, you will add about an inch of oil and allow to get HOT over medium high heat. In small batches, add the eggplant. Once you see the edges turning brown, after a bout 2-3 minutes, flip and cook 2-3 minutes more. Once the eggplant is finished browning, place on a paper towel lined baking sheet and season with salt. While the eggplant is resting, grate your cheese. Now it is the moment you have been waiting for! Put a thin layer of sauce in the bottom of your baking dish. Then, place a layer of eggplant on the bottom. Sprinkle a layer of cheese. Keep up with this process until your baking dish is full and you have a layer of cheese on top. Place in a pre-heated 350 degree oven for 45 minutes. Serve this with a nice, crisp salad, and a crusty bread. PERFECTION! With comforting Meatless Monday dishes like this, I promise even the most passionate carnivore in your family will be satisfied! You will never look at vegetarian the same way again! I DARE YOU to try it! Place, in a single layer, on paper towel lined baking sheet. Season with salt on both sides and allow to set for 30 minutes. In a sauce pot add oil, onion, and garlic. Add the crushed tomatoes to the pot along with a half a can of water. Add salt, pepper, chili flake, and brown sugar. Stir and let simmer over medium/low heat for 15 minutes. Add flour (seasoned with salt and pepper), eggs, and Italian bread crumbs to three separate dishes. Coat the eggplant in the flour, then the egg, and finally the bred crumbs. Add to a skillet of HOT oil about an inch deep. Fry for 2-3 minutes until the edges are brown. Flip and fry for 2-3 more minutes. Remove from skillet, place on paper towel lined baking sheet, and season with salt. To a baking dish, place a thin layer of sauce to the bottom. Now place a single layer of eggplant. Place in a 350 degree oven and bake for 45 minutes. Remove from oven and let set for 15 minutes. *If using dry basil, add with the seasoning in the sauce. ** If preparing the night before this is the point that your would stop.